5 weeks, 2 daysHow long will it take?This product is currently on order from our suppliers and we are expecting to take delivery of new stock on or before 29th May. It is advisable to order early as it is not uncommon for all stock to be pre-ordered for customers before arriving at our warehouse. Bulletproof Kriega quality as you would expect, this isn't as fiddly to deal with as it looks once the straps are fitted - and as such I am using it as a work bag with the shoulder strap attached - works perfectly, is waterproof, and is designed to be practical as well as secure. Excellent. A must buy. So much better than a backpack and very easy to use. Higher priced bags the Kriega range but completely worth it, extremely well made, totally waterproof, great modular system to combine the different sizes in any combo, 10 / 10. Alright for commuting or short weekend trips. Solid build. Needed a few tries to fit it nicely on Duke 390 2019MY. Second one of these after the first was stolen. Quality is excellent. The US-20 is friendlier to commuting and a weekend away than for touring. Go for the US-30 for bigger trips. 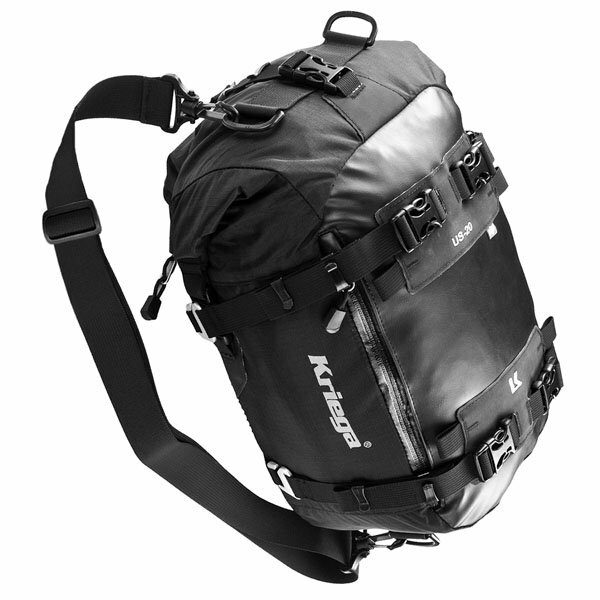 This is a great bag to carry clothes for a few days away either on it's own if you travel light or combined with other Kriega packs. It's definitely 100% waterproof and can easily be wiped off if it gets dirty making it look new again. Once the straps are fitted, which initially can take a while, it's very quick to put on and off the bike. 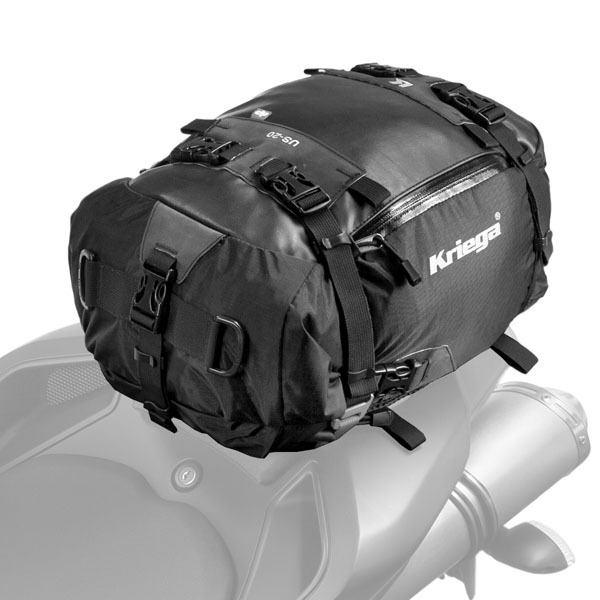 If I was only buying one Kriega bag I'd probably go for the US20 as it gives you more flexibility on carrying things and can easily be rolled up a bit more if it's not full. Great bag, ideal and easy to fit, nuff said. Fantastic practical bag. Can get my laptop, work shoes and usual paraphernalia I travel with and still room to spare. Brilliantly designed and crafted with real care and precision. Not to mention super fast delivery from Sportsbikeshop! Only just fitted to my old VFR. Very easy. Looking forward to seeing how it fairs on trip to Alps this coming weekend. Rain forecast! I haven't had to test the waterproof capabilities of this bag yet but I would be very surprised if it lets a drop of water in. The quality of materials and construction is very high and in my eyes justifies the price. You can fit a surprising amount inside but also use the straps to squash it down if empty and the top pocket is handy for things you want accessible. The only downside is that the straps that attach it to the bike mounting loops are a little fiddly to remove and if you leave them in place they hang down and flap about if riding or could get pinched if you park somewhere dodgy. 20 litre capacity 100% waterproof tailpack. Innovative design solution which can fit directly to the bike with four alloy hooks. The US-20 also comes equipped with removable shoulder and waist straps. It can be carried courier style, on or off the bike. Anti-slip mesh base also doubles as a pocket to store the shoulder and waist straps when the US-20 is attached to the bike. The shoulder strap connects to the large D-rings at each end of the pack and the waist strap connects to 2 fold away buckles at the corners of the mesh pocket. For a pannier system use standard US-hook and subframe straps through the lid handles or for a tank bag, these fit very easily and quickly to the web ladder loops on the tank product. To take off, use the four quick release buckles to release the pack and the grip base away from the straps. The US-20 can be fitted to a dirtbike rear fender by using Kriega's rack loop product. Four alloy fasteners with web loops allow US-packs to be hooked on, across or inline with the bike. Are the sub frame loops included or do you have to buy them separately? 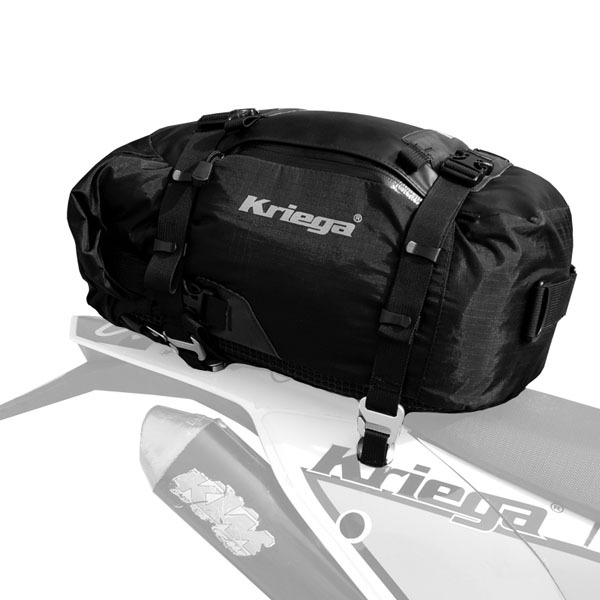 The sub frame loops are included with the Kriega US-20 Drybag. does anyone know if this type of bag will fit a yamaha 2009 yzf r125 ? These bags are designed to be a universal fit. If you watch the short video at the bottom of the page, it demonstrates a couple of different ways to fit it to a motorcycle.